Why do they just look like a normal bunch of fun 21 year olds? Oh, because they are, adding on a major record label and instant fame. Straight out of Worcester, MA, Dom, an increasingly popular electronic alternative group, started out small like a typical garage band. It was actually last winter when my roommate put some of their fun, dance tunes on her iPod during a party. She said it was her friend’s band from Worcester, and now they’re touring with passion-pit, have a major record label, and are even featured on commercials and MTV shows. How did all of this happen?! They started playing local shows in Worcester bars and party houses in Amherst, MA. Their friends knew they were awesome. They released their single “jesus” in January 2010. Another Worcester band, Golden Girls, would feature Dom at their shows. Since they were all good friends, the two bands came hand in hand with each other. All of a sudden, Dom was signed by a major record label, Burning Mill Records, in April 2010. They’re album “Sun Bronzed Greek Gods” was out and people were interested. They opened up for Passion-Pit, an electronic rock band. Dom started touring all over the country, from Las Vegas to California and back to Boston. 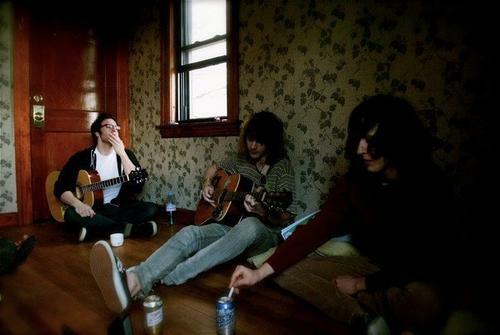 They were on Pitchfork’s 2010’s Best New Music and they are going to perform at the Boston Music Awards in December. If you like fun, alternative music, then give Dom a chance. Songs like “Living in America,” “Burn Bridges,” and “Hunny” are definitely on my party-playlist. Fun Fact: After the UMass Dartmouth Frisbee team “Moon Unit” played “Sun Bronzed Greek Gods” on a boom-box at a tournament in Keene, Dom found out and told the team they would be their official sponsors. However, besides putting it on their MySpace page, nothing has come of this yet.